Shopee is bringing back the biggest sale of the year! 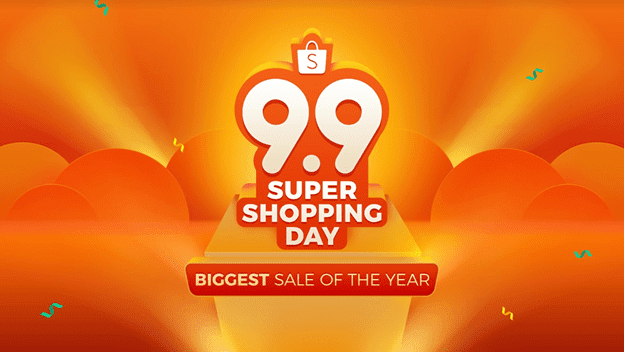 After the successful event last year, Shopee is once again having the 9.9 Super Shopping Day, which is an 11-day mega shopping event where online shoppers can avail great discounts of up to 99% and exciting promos and giveaways worth over Php15M! Super Flash Sale Day (August 30) - Flash deals from as low as Php99 are up for grabs. You have to hurry up though as this offer is for limited time only! Super Vouchers Day (September 3) - Up to Php 900,000 worth of vouchers are to be given away! Super Brand Festival (September 5) - Shopee has partnered with some of the leading brands in the country to give out huge discounts and great deals on different products including electronics, mobile and gadgets, and health and beauty. Some of these participating brands include P&G, Maybelline, Samsung, Vivo, Colgate - Palmolive, OPPO, Asus, and a lot more. Super Shopee Shake Day (September 8-9) - Over 9 million Shopee coins, vouchers, and other prizes are to be given away by playing the highly popular in-app game, Shopee Shake. Win Php 100,000 in Shopee Dance competition! The big shopping day was kicked-off during an event held at Shangri-la at The Fort. Gracing the event is Shopee's Brand Ambassador, Anne Curtis, where her latest Shopee TVC was also launched. Dancing to the tune of Baby Shark, you too may join the latest dance craze and win Php 100,000 cash and more by joining Shopee's Dance Competition. To join, simply post a video of you and your friends dancing the Shopee Dance with the hashtags #ShopeePH99 and #ShopeeDancePH. You may post your entries on Facebook and Instagram until September 9, 2018, 11:59PM.